Do you need a DSL line filter? Keep interference in check, for clear running equipment, when you connect with this device found at www.TWAcomm.com! 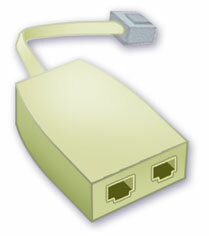 A DSL line filter is needed in a splitter free installation (connected by plugging into an existing phone jack verses hard wiring to its own line) of DSL service where the phone line number is shared by other devices. Each device that shares the same phone number, such as any phones, fax machines, answering machines, a caller ID box, or satellite or cable TV services connected through the phone line should be connected with a DSL line filter. Without the installation of line filters, line noise will be experienced with your equipment, as well as reduced performance and connection problems with the DSL service. Fortunately, DSL line filters have made it easy for consumers to install their own DSL service and are readily available to cover the form of installation needed. For instance, a phone jack that shares the DSL connection with the modem and another device would need to have a DSL line filter designed for that application. This filter would be made up of a splitter and filter combined and contains at least two ports. Always make sure to plug the DSL line into the DSL port of the line filter. A mix up in installation will cause a buzzing sound in the voice equipment, but will not damage the telephone or modem. DSL Filters come in a variety of styles including: In-line (connect to the jack and then plug in the cord connected to the device), wall mount filters (for wall mounted phones) and flush mount filters (replaces existing wall jacks), which can easily be installed by the consumer. Purchase enough DSL line filters to be used in each phone jack that is in use that shares the same phone number as the line that DSL service is being delivered.